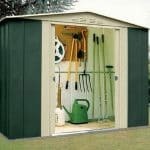 We were impressed by just how spacious this metal shed is for a price of under three hundred pounds. That makes it a smart choice for most sized gardens, especially for people who don’t like the idea of the annual maintenance requirements that are traditionally associated with timber sheds. Thanks to its green and cream paintwork as well, which was immaculately applied inside and outside, it will also fit into your garden without appearing obtrusively metallic. Another advantage that metals sheds can bring over timber ones is their level of weather protection, as demonstrated here. The apex roof is made of the same galvanised cladding as the walls, and both are therefore excellent at stopping rainwater from penetrating into the shed itself. That’s backed up by a long 20 year warranty against perforations caused by rust. We were pleased to see that a wide range of optional extras were available for this shed, from a timber floor support kit to sliding windows and corner and rear shelving units. This makes it easy for the customer to get the shed they truly want, without the need for too much additional expense, although we would also recommend the purchase of a padlock to improve security. 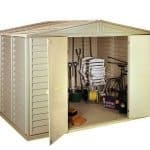 This spacious metal storage shed caught our eye for many reasons, and the first was its appearance. Through the use of corrugated metal cladding in a well executed green and dark cream colour scheme, it combines both the traditional and the contemporary. It was good to see that it offered extra protection against both rain and condensation both inside and out, and that the interior was painted in the lighter colour which has the effect of it seeming more illuminated when the door is opened. We were pleased to note the above average height of this shed when compared to others with a similar footprint, and this is itself enhanced by the apex roof. As well as carrying out the essential task of channeling rainwater away, it gives a peak height of 1.98m which is backed up by an eaves height of 1.78m. 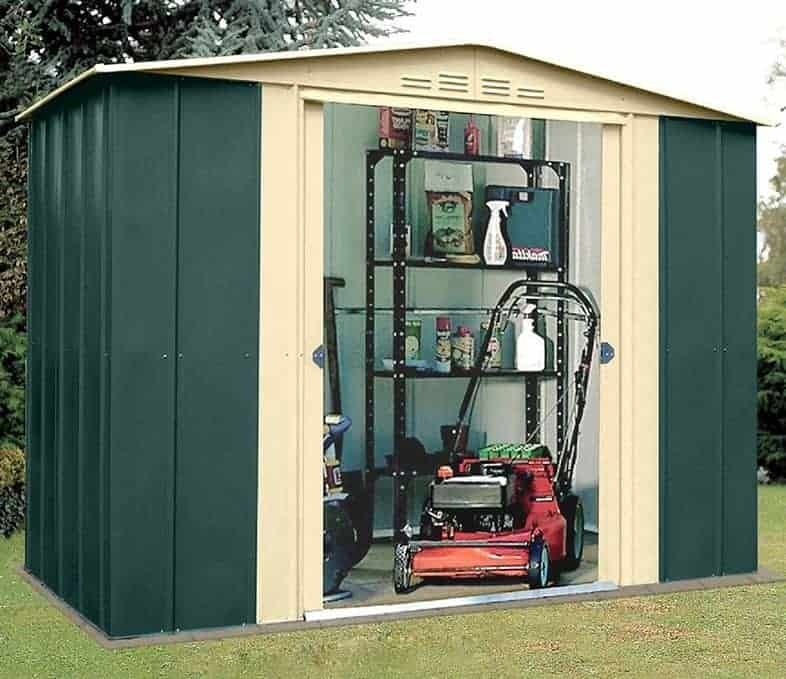 When selecting an area upon which to install this shed, you’ll need to know the overall width which is 2.33m and the overall depth which is 1.75m. 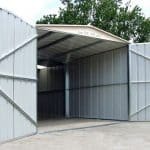 We often review lightweight metal sheds such as this, and often the thin cladding belies the overall stability once installed. That’s certainly the case here; although the cladding has a thickness of only 0.25mm, less than on many metal sheds we see, once assembled it felt reassuringly solid and should withstand even strong winds. There are two reasons for this: one is the high quality galvanisation which has been used to give the cladding more strength; the other is the thicker nature of the strength imparting galvanised frame, which is over twice as thick as the cladding itself. It’s important to note that there is no floor with this shed, so you’ll need to find a suitably flat and suitably sized area of concrete or patio. This isn’t unusual, although most sheds we review do included an anchor kit instead of requiring one to be bought separately as in this instance. The standout feature of this shed, in our opinion, is the 20 year warranty provided by the manufacturer against perforation damage resulting from rust. This is twice as long as that supplied with many other metal sheds we review, and shows just how effective the galvanised cladding in conjunction with the apex roof is in stopping water taking hold and forming rust. As the unit is fully painted, there’s also no requirement for any treatment to be carried out by the owner. Another feature that we really approved of is the double sliding doors. Fitted internally, which gives them added protection from the elements, they felt smooth and solid in operation, and opened to a width of 1.04m and a height of 1.70m. There’s also a built in ramp, which when used in conjunction with the very accommodating proportions of the doors means that it’s very easy to transport objects of any shape and size in and out. There are no windows, but the ventilation supplied through the gables ensures that the interior never becomes too hot or stuffy; this is welcome news for the goods stored inside as well as the shed owner who may want to spend time inside the shed. If required, there is also the option to add a window or skylight, which we really appreciated. 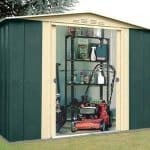 With no windows, unless one of the optional extras is taken up, privacy is greatly enhanced as is security, because anything valuable within the shed is hidden out of sight. Whilst we welcomed that security feature, it’s a pity that the security couldn’t have been enhanced still further with the inclusion of a padlock. If bought separately, as we would recommend, a padlock can easily be fitted through the ready holed handles. 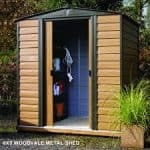 It was good to see that there are so many optional extras available for this shed, and two of the most useful in our opinion are the skylight and sliding window. Both are reasonably sized and priced and come with styrene glazing. This makes them stronger than standard glass, so you won’t have to worry about accidental chips or shattering. If you like natural light in your sheds then these are perfect choices. As an anchor kit isn’t included you’ll also have to purchase a set of Hilti screws, if you already have a concrete base, or a steel foundation kit if you don’t. Alternatively there is the option to purchase a timber floor support kit. We like that this enables the customer to install a wooden floor, but bear in mind that the timber itself isn’t included, and at £115 this isn’t the cheapest optional extra. Shed Baron have a well deserved reputation for using high quality components, and this was evident throughout the shed as a whole. At a thickness of just 0.25mm the cladding could have been thicker, but it didn’t seem to lack strength and is covered against rust caused perforations for 20 years. With extra height afforded by the tall eaves, and the large doorway and ramp making entrance easy, we found that this is one shed that seems bigger on the inside than it looks from the outside. With so many small parts, it pays to be well organised before beginning the installation process. Between two of us we took approximately five hours to install this shed, with the door and roof taking the longest time, but be prepared to allow a little longer. We think that just under £300 for a well proportioned and well constructed shed is very good value for money, but if you add a flooring kit the cost will significantly rise. Final Thoughts: There were so many things to like about this shed that we would have expected it cost much more than it actually does. The only real downsides are the absence of a padlock and the lack of an anchor kit, but these are more than compensated for by features such as the wide and tall sliding double doors that lead out onto a tough and durable ramp. Durability is one of the key factors of this shed, as shown by the 20 year warranty that isn’t dependent upon any treatments being carried out by the owner. 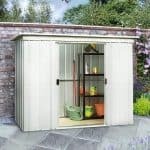 With the addition of a sliding window, just one of the optional extras that also include shelving units and water stations, this will make a pleasant garden building in which to work or pass time.